The depth of Greenberg’s commitment to a particular way of looking at painting and sculpture is best measured when we consider the historical context in which these seminars and essays were produced. The late 1960s and early ‘70s were a time when the high modernism that Greenberg had championed for around three decades had run its course in the United States and Europe, and was being displaced by a different conception of art-making and appreciation. What was really new in trends like pop art, minimalism, performance art, etc., was not so much the revolutionary fervor of their proponents but their implicit and sometimes explicit declaration that the idea of quality was irrelevant to their artistic practices. For Greenberg, nothing counts as “art” at all unless it persuades the viewer as to its artistic quality, and the mode of conviction associated with quality is necessarily a matter of individual experience rather than of logic. An object doesn’t count as art unless and until it convinces us that it is good or bad art, and logically it cannot be good or bad art unless it is art. The reasoning appears to be circular, but not necessarily as a vicious circle because it accurately reflects the data provided by our own experience and by the way we talk about art. In a gallery or museum or artist’s studio we do not encounter objects that are somehow classified as “art”, and then decide whether these are beautiful or moving or not. Rather, it is only in and through our judgment of the thing’s artistic quality (good or bad) that it is treated as art in the first place. In any event, during the late 1960s it had become apparent that the operative question was no longer “is it good art?” but rather “is it art or something else?” The eclipse of the idea of quality occurred at a time when challenges to authority had migrated from society’s fringes to become the norm, and the concept of artistic “taste” was seen as an expression of elitism based on unexamined assumptions including the anti-democratic assumption that some people (e.g., wealthy white males in coastal urban centers) are better qualified than others to judge artistic achievements and aspirations. Dispensing with the idea of artistic quality meant dispensing with the practice of evaluative art criticism, which had been Greenberg’s professional livelihood throughout his entire career. This is the context in which the seminars and essays collected in Homemade Esthetics must be read, and it explains to some extent the force of Greenberg’s rhetoric. Greenberg says that the irrelevance of quality in the latest art is related to its indifference to convention – one of the provocative insights to be found in Homemade Esthetics. The medium of painting consists not in a set of material objects and tools, but in certain conventions that historically have allowed painters to use those materials to make themselves intelligible in ways that are specific to the art of painting. At any given moment in the history of painting, the artist inherits those conventions as a kind of resistance – resistance that at once forces and enables the artist to formulate or formalize personal feelings in painterly terms. Resistance – the resistance of physical materials such as paint and canvas and of impersonal norms such as flatness and rectilinearity – forces the artist to make decisions. It is in apprehending the artist’s decisions and their significance – their “intensity and density” – that the viewer finds – or fails to find – value, quality and interest in a work of art. The problem with the self-proclaimed avant garde is, according to Greenberg, that it is indifferent to convention. Therefore, we do not feel that the artist’s decisions are meant, or that they are really decisions at all. (It is part of the grammar of “deciding” that decisions are made under pressure.) “What is relatively new about the badness of recent ‘advanced’ art – new, that is, in the context of formal art – is that it is so boring and vacuous. This, because of the large absence of decisions that could be felt as ‘meant,’ as intuited and pressured, and not just taken by default.” (49) A comparison of Picasso’s base-relief sculptures made around 1913 with Marcel Duchamp’s first ready-mades at the same time reveals the distinction between decisions that are meant and those that are not. By the time he made Mandoline, Picasso had already engaged with and altered the norms that allow three-dimensional reality to be depicted in a painting made on a two-dimensional flat surface. Mandoline extends the logic of the collage, transposing the shallow layered planes of cubist painting into the literal space occupied by the viewer. Projecting ourselves into the position of an early 20th-century viewer (i.e., a viewer not already accustomed to the radical changes in painting and sculpture that Picasso’s work enabled), it’s easy to imagine the shock it must have elicited. I imagine it was an essential part of that shock that the piece be seen and accepted as a sculpture. Shocking because one might have assumed – without really looking, as it were – that a sculpture is a solid mass that is sculpted or worked (carved, molded, formed, etc.) into an illusion. But here is something that is intuitively (and thus undeniably) a sculpture, and it is precisely not carved or molded or formed or worked. The point is this: Mandoline (and other works similarly inspired) could not have altered the norms and conventions of the art of sculpture had it not been apprehended on an intuitive level as a work of sculpture. On the other hand, Bicycle Wheel simply abandons the norms that Picasso challenges. I imagine that upon first encounter with the piece, the early 20th-century viewer would have asked herself, “is it a sculpture or is it something else?” And the answer to that question could only be provided by intellect, by way of a theory, not intuition. Although our 21st century sensibilities have been conditioned by decades of Duchamp-style cynicism, we may find ourselves asking ourselves the same questions today concerning the objects exhibited by Duchamp’s many artistic heirs. Are not the conventions that define sculpture merely arbitrary at the end of the day? And if those conventions are arbitrary, then by implication so are the rest of the conventions that inform us that art-objects are somehow different from other objects we encounter in the world. Duchamp’s read-made raises these questions as if a work of art were a kind of artifact to be examined and classified according to an established cultural taxonomy that is prejudicial to begin with and can simply be cast aside in the quest for the new and different. There is surely a truth buried in Duchamp’s questions, but the truth emerges as a feat of intellection, not an achievement of intuition. The first viewers of Picasso’s Mandoline knew it was a sculpture; and because they accepted it as a sculpture, its innovations must have invited them to ask themselves if they really knew why they accepted anything as a sculpture. By contrast, to see Bicycle Wheel as a sculpture would be to miss the point – the point being that literally any ordinary can be seen as a sculpture if only it is placed in a space (e.g., a gallery or museum) traditionally occupied by works of so-called “art” – and if that is the case, so is its reverse: no object, including objects made by history’s most accomplished practitioners of sculpture, must be seen as so-called “art”. It is always open to human beings to miss what it is that makes art worth the bother. Only an object that is accepted as a painting or a sculpture can provide a criticism of and therefore, potentially, effectuate an alteration of the norms that allow us to recognize anything as a painting or a sculpture in the first instance. It follows that these norms are constantly changing (although not “evolving”), sometimes in ways that are incremental, sometimes revolutionary. Only someone committed to the art of sculpture and acting within the framework of that art is capable of changing the criteria for what counts as a sculpture. Duchamp shows us that anyone, even an outsider, can comment on the art of sculpture, but why do we need to be told that? After all, anyone can comment on anything, but that fact does not imply that just any comment is relevant or pertinent or enlightening or helpful or interesting. Greenberg says that when criteria of quality disappear from art-making, art as such disappears. “…when no esthetic value judgment, no verdict of taste is there, then art isn’t there either, then esthetic experience of any kind isn’t there. It’s as simple as that.” (62) Why is this? The comparison of Picasso’s Guitar with Duchamp’s Bicycle Wheel shows us that what Greenberg calls “taste” is not a matter of psychology but of logic. Nothing, not shaped and painted slats and sheets of wood or familiar objects placed on stools in the manner of a pedestal – no set of material objects or tools counts as a medium of sculpture – in the absence of the art of sculpture. For human beings, material things have only the sense we give them; the materials and tools wielded by the sculptor can be the medium of an art only insofar as they are used by human beings to make sense to one another. It follows, according to the logic of modernism, that the continued existence of an art is never physically assured. Rather, the continued existence of an art is something that must be achieved, and it is achieved only in the making of objects that bear up to standards of quality inherited from the historical past. At last someone has taken the time, for a long time, to examine in detail what Greenberg actually said. My only quibble is over the interpretation of the word “resistance”. Not having these seminars to hand, my memory is that Greenberg is talking about the resistance in the observer to accepting or liking new and challenging works of art. Difficult art evokes resistance in the viewer, and overcoming that resistance is part of the evolving of one’s “taste”. And the artist is subject to this too, overcoming resistance to the imagined “ugliness” or “badness” of one’s own work. And as I have written in my piece on Greenberg and Modernism over on Abstractcritical, this is confirmed by Greenberg’s own experience in relation to Pollock’s Mural of 1943. At first he didn’t like it, and it took time for him to see it’s potential in relation to Pollock’s future development. But of course as Carl brilliantly puts it, this is an entirely different species of difficulty from the ones raised by Duchamp and his poisonous legacy, in which the art world is currently and seemingly permanently immersed. 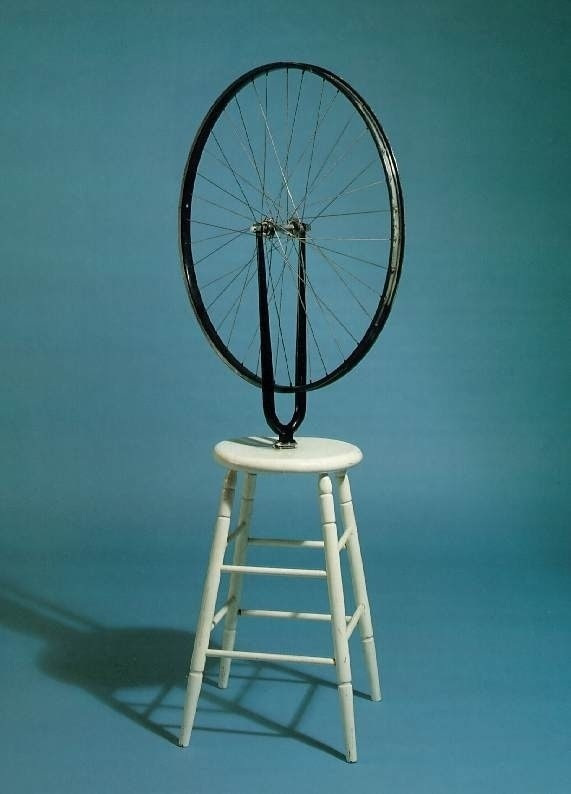 Duchamp’s point would appear to be that anything in the world, however banal , can be viewed aesthetically if we care to look at it that way, even including his readymades (as if we didnt already know that from the prior history of French Romantic aesthetics). And even including photographs of proliferating cancer cells. There is a passage in William Tucker’s The Language of Sculpture in which he describes his surprise the first time he “saw” a Duchamp bottle rack as sculpture. But we are now in a time when the ever diminishing potency of such “surprises” has reached total fatigue. Another point that Greenberg makes is that the surprise engendered by a genuinely new and difficult work of art is a totally different kind of surprise from the surprises of life or history, say the surprise surprise of learning that Trump’s daughter has benefited financially from trade deals with the Saudis, or the surprise that Damian Hirst has plagiarised someone else’s work again. Touché — although it doesn’t follow that all consciously “difficult” art ends up being declared or agreed to be “good”. Work can be difficult without aiming to be, or without being complex. The jury remains out for some time on that. Just saying! Much as I like Greenberg, I think the jury has come back some time ago with a thumbs-down on a modernist expansive pictorial flat simplicity – at least for sculpture – which he had more than a bit of a hand in. And as I’ve said many times, complexity is not an “aim”; but then “simplicity” for its own sake can’t be either. We might be able to agree on “clarity”…? But it’s not straightforward to achieve clarity in three-dimensions. So here he is using the word “resistance” with reference to the creator of art, and specifically the resistance “offered by the conventions of a medium of communication.” Conventions offer resistance because the creator wants to say something unconventional, meaning personal. But at the same time, conventions amount to the conditions of intelligibility that previous creators have used to say something publicly to other human beings by way of sculpture, painting, poetry and so on. Perhaps one way of thinking about modernism is this: modernism occurs, and needs to occur when it appears to the artist that NO inherited convention could possibly be used as the medium of expression. There are no known structures or forms that must be followed if one is to be understood, from which it follows the medium must be re-discovered or invented out of itself. Wow! –Did I really say that? Anyway, Carl’s quotes from Greenberg show just how silly it has been to try to cast Greenberg as a discredited figure, and even more silly to cast Brancaster as the scourge of Modernism. Robin could almost have said that about resistance himself, if he wasn’t so keen to paint himself as a scourge. My version of the use of “resistance” comes from a different seminar. I remember it well, since I quoted it in a letter in Artscribe , to back up my observation of a marked affinity with the ideas of Roger Fry. But in doing so I underestimated the originality of Greenberg’s take on aesthetics, concerned as it was with particularly late 20 th century dilemmas. PS. Jeremy Corbyn for pope! BTW. I had intended to delete that bit about pagan artist for the collected works. Although partially true, was it not also the case that Michelangelo was an ardent disciple of Savaronolo? (spelling– you see I am no art historian) . His Modernism therefore consists in this split psychology, a “divided self” in the parlance of R D Laing, who by the way went to the same school as me, and from the same suburb of Glasgow. Yes indeed — no constraint, no tension. The constraint in painting is the two dimensionality of the picture plane. What is the constraint in sculpture? Why it’s gravity, of course! Or it has been until now? How about the tension between the literal and the sculptural? Between real space and illusory space? Between literal materiality and sculptural physicality, of which gravity may or may not be a part. Or maybe between the actual movement in time of the viewer around the piece, and the implied or imaginative movement within the content…? Matisse, Brancusi, Arp, Moore, Chillida, Stella… created their sculptures and assumpted, included gravitation to artistic sculpturals constraints? Or maybe only technical constraints? Alan’s “Proper to Sculpture” essay is in Artscribe #25, October, 1980. If you’d like to send me your regular mail address (you can send it to jockireland@earthlink.net), I can send you a Xerox. Alan’s essay is very important and very exciting. The other day I sent a couple of paragraphs from Alan’s essay to my friend Bruce Gagnier, a New York artist, a “figure sculptor,” a guy who “hates” Greenberg (without, of course, having read much of Greenberg’s writing). Bruce made a couple of wisecracks about this and that—wisecracks that I’m sure would make Alan smile. Bruce and Alan are about the same age. They’re very different in all kinds of ways, but “deep down” they believe in/they’re deeply engaged with exactly the same things—the same things Carl helps us get at in Greenberg. thank You, I would like to read it. I am using the address that is given on my website. But of course I can send you also. Regarding the “discrediting” of Greenberg. While someone can “discredit” the argument presented in “Modernist Painting”, for example, it’s difficult to see how one might discredit Greenberg’s interpretation of Paul Klee’s painting in a couple of really brilliant essays. For what would be discrediting is taste itself, the ability to discriminate one thing from another, the beautiful from the ugly, the pleasant from the unpleasant, and so on. One would have to discredit esthetic experience itself, the idea that there is such a thing. But every human being already knows there is such a thing – unless of course, you look at a sunset or sunrise and “naturally” feel nothing different from what you feel looking at a 4’ x 4’ section of a gray wall – or a bicycle wheel positioned on a stool. Greenberg says that taste persists, always and everywhere, despite efforts to do away with it, it always comes back and asserts its authority. We keep on finding or attributing VALUE in or to some things and not others. Work by Hirst or Koons seems to recognize the persistence of taste while at the same time cynically ridiculing it. Their work says in effect that esthetic value is as arbitrary as monetary value, Post-modernists insist on this idea of arbitrariness – taste is arbitrary (because judgments of esthetic value are different from judgments of science in that universal agreement is not forthcoming); taste is prejudicial (because it is culturally determined – everything a middle class white male says and feels is based on historical exploitation of non-white underclasses and the denigration of non-males), and so on. None of this would come as news to Greenberg. To say that “taste is arbitrary” is simply to say that in every case it is one’s own taste, that it may differ from someone else’s taste, and to express it in the form of public esthetic judgments is to take responsibility for it. How could it possibly be otherwise? And if these things could not be otherwise, there is no more point in calling taste “arbitrary” than there is in observing that it’s arbitrary that I am me and you are you. This implies that the critic is someone whose taste is presented as exemplary not in the sense that one must agree with its judgments, but in that its judgments invite you to find out for yourself whether or not you agree and why. To Janusz — yes I do mean that, although they may not have been fully conscious of it, except in the case of sculpture in niches or alcoves, though even there? It comes to play in free-standing sculpture, even if attached to a base, as in carving or welding. See Tucker’s book on all of this. Of course it comes to the fore as a modernist constraint, but was lmplicit before then. Archaic Greek Kouroi are fully aware of stance. Rodin’s Walking Man and John the Baptist revive it into the 20 th century. And could we know how tension and gravity relate to “Quinquereme” and its expansiveness? “The structure of the sculpture is identified with the structure of the figure”. It can be assumed that the problem of gravity has become a topic treated more conscious by sculptors, but the list I mentioned (note that I omitted Rodin) proves that the majority of sculptors did not take up this problem as important. As an artistic assumption, for example: “the shape of my form results from the fact that I consider gravity as an important factor shaping the forms”. Also the form of the Greek figure whether it is lying or standing very poorly responds to changes that should appear in the body. I do not insist, but it seems to me a little bit suspicious, to see this assumption implicit in ancient sculptures. Maybe only in that sense, that they work like architecture, but I suppose this is something different… But even if we agree, there ar still plenty of artists like Gabo, Pevsner… All of them do not allow for conclusion that the problem of gravitation in sculpture is as important as the problem of flat plane in painting. Back to the text of Carl, below I write also a comment, to what he wrote in his comment. Not only that, but the latest findings in mathematical physics still confirm gravity as the fundamental force in the universe despite all the revisions that have taken place in the last hundred years. But don’t ask me to name the physicists. I read about it in a review of the latest work in the field in one of the Sunday papers. Donatello’s prophets , though in niches, are aware of the problem of stance. I remember comparing them to 13th century Japanese carved clothed figures in Proper to Sculpture, but do not have a copy with me to give detail. …and is “stance” relevant to abstract sculpture? You tell me! You’re the sculptor. But this is all straying too far away from Carl’s brilliant essay. It is ground that has been gone over and over for the past thirty years or more. Let’s not rehash it all over again. It is also a fact that an influential art critic can block out some artists and help others, even though it is only his taste. I know you love Greenberg. The question is, do you love him more than art? Even such a great art critic as Greenberg, could not stop the practice of art. Aristotle was great and stopped the development of natural sciences for 700 years. As soon as someone wanted to say something different, his mouth was closed. Ipse dixit – He said! Eh, this disgusting post-modernism. Why did he ever appear? Have all the philosophers of postmodernism been crazy? Contemporary artistic practice brilliantly connects these two worlds very well. In art everything is possible, even this. “Small” remark about Greenberg and Kant. Greenberg treated the judgment of taste for nature just as for art. Is this not a reduction of art? “Duchamp shows us that anyone, even an outsider, can comment on the art of sculpture, but why do we need to be told that? After all, anyone can comment on anything, but that fact does not imply that just any comment is relevant or pertinent or enlightening or helpful or interesting”. Oh. how it incidentally good fits to my presence here! Yes, the gesture of Duchamp from 1913 was so shocking… Even Picasso did the same gesture later, much later ( Bull`s Head – 1942) Oh, I have forgoten, Picasso did it muuuch better! What do we need yet, to state the obvious thing, that there is no possible to uderstand art and really valuate objects of art out of its context! How, in 21 century we can not agree, that there is also the “beauty of idea”, the beauty of concept, the beauty of inteligent conotations , meta -meanings. … beauty of “distant” associations. If You will ones try to find an original idea, you will see, that it is much much more difficult, than making “good” painting or sculpture, because there are in the world billions of people who have great ideas. So, because of this, the gesture (Bulls Head), 39 years after Duchamp, means for me nothing, although it can be more beautiful! Too late! In other cases Picasso shocked and opened new doors. Can you relly name one sculpture from Picasso due to its beauty or harmony (omitting its originality – the context!)? Duchamp did not poisoned the art, he showed us, how important is the relationship between form and its meaning, that the meaning can be detached from form, replaced! And even Arthur Danto shortly before his death (What is art , 2013) had the ilumination, that art does not take place in the space of material objects, that the human world is not played out in the world of physical states, in the nature ( I would add – in world 1 – according to K.R. Poper). For a dog, wood and wooden sculpture.. It is the same. But we can not limit the art world to physical sensations, to judge the art relying on “intuition”, because we do not want to read and learn theories and history anymore, update our knowledge (I do not deny, that there is a special knowledge derived from practice). Tim! What’ve you been teaching this guy? From “An Essay on Paul Klee” from 1950. Ordinarily Klee does not create unit of design by a large scheme that the eye takes in at a glance; this was the Italian, the Renaissance mode, in which design always betrayed some affiliation with wall painting and architecture. Klee’s feeling is ornamental rather than decorative, if the distinction may be permitted – analytic rather than synthetic: he produces by intensification, not by extension or projection; it is fission and subdivision rather than addition. He works in small format in the tradition of manuscript illumination. His pictures are for very private possession, to be hung on near and intimate walls. Because it is small, the picture demands close scrutiny, confining visual attention to the compass within which the eye can travel with least effort through intricate complications of detail. Yet the eye does not make an instantaneous synthesis; with Klee design is, as it were, temporal or musical. We are conscious of elements that are to be felt in terms of succession as well as simultaneity. The all-important factor is line. Klee’s line seems rarely to enclose a shape or mark a contour with definiteness; nor, as a rule, does it vary in width or color value along a single trajectory. That is, it has little plastic feel, so that it is hard to say whether it is heavy or wiry, cursive or stiff, sinuous or angular; it is all these things and none. At most it is scratchy. At times, it is feathery. Adjectives do not fit the case as well as verbs. Klee’s line indicates, directs, relates, connects. Unity is realized by relations and harmonies that play across neutral areas whose presence is more like an assumption than a fact. Because line – and color too – are like disembodied elements that do not adhere to bodies and surfaces, because there is an absence of weight and mass, Klee’s pictures have a tendency sometimes – when the oscillating, wavering, flickering movement that should unify them fails – to float apart into mere groupings of pictorial notations. Curiously, this happens most often (at least before his final phase) when he tries to put himself at the furthest remove from decoration. On the other hand, he produces some of his very best work when he deliberately incurs that danger. It is when the picture is nailed down so firmly at the corners, with everything spread so evenly and symmetrically – in little squares like building blocks or horizontal bands like ruled paper – that his work achieves its greatest force. What might seem in conception only a tinted patter becomes in actuality as dramatic a thing as if possible on a flat surface. In this, his ability to exploit the decorative without succumbing to it, Klee made one of lost important conquests of modern art. The problem of decoration versus easel painting remains the most critical one facing art today. The difficulty that besets the post-Cubist and abstract painter is that of overcoming the essentially decorative inertia into which his picture always risks falling because of its flatness. The easel painting has from the first relied upon the illusion of depth, of composition in depth, for the dramatic interest it must have to overcome its relative smallness and isolation. Now Cubism has banished that. But Klee could not altogether accept the flatness of post-Cubist painting. He showed his dissatisfaction with the impenetrability of the picture plane – impenetrable in so far as he could not pierce it by perspective or modeling – by worrying the surfaces of his pictures, by working in a variety of materials and mixing his m and by mediums, and by returning incessantly to watercolor, where he could exploit the curl of the moisture-laden paper for the unevenness he wanted. Still, all this was too external in a sense, too physical and mechanical; the real solution had to come from within and be less tangible. Klee sought it in color – and I think he succeeded. Klee’s color does not have the range or register of his line. It is washed on in tints: light, tender, thin – un-modern. It seldom inheres within definite contours, nor does it become opaque or solid (modern) until the artist’s last phase. It does not describe or define any more than his line does; it becomes intense or fades like light itself. Yet such color, in Klee’s hands, did succeed in achieving a kind of depth. Not a depth in which represented objects are probable, but a matter of suffusions and breaths of color that create a faraway, ambiguous glow. Against this backdrop, lines peregrinate like melodies across chords. The surface palpitates, signs appear and disappear, yet we cannot tell whether this takes place in fictive depth or on the real surface. I posted this extended quote because I think it really shows Greenberg’s power as a critic, his ability to fuse visual experience with written expression, to make them almost seamless concerning a painter (Klee) who is, as far as I’m concerned and in large part because he didn’t really follow or fit into any particular discursively-defined “movement”, is one of the most difficult modern artists to comprehend. The peculiar charm of Klee’s paintings make one WANT (if not need) to articulate the source of the appeal, but it’s very difficult to pin down. I think Greenberg does it in exemplary fashion. I agree entirely, probably THE best of his writing, and it should be read in its entirety, right up to the very last line. The reason why so much effort has gone into trying to paint Greenberg as discredited or a spent force is precisely because of the authority such writing as that on Klee evinces, and its knowledgeability of the problems of modern painting. If someone who shows such authority then goes on to declare what you are doing minor, academic, tasteless, reactionary, pseudo-avant garde, or lumpen-avant garde, or in other ways deficient, you are likely to take offence and to hit back any way you can. And given the nature of today’s massive promotional machinery and spawning of “fake news”, and the overweening influence of the market, it doesn’t take long for the record to be distorted in favour of that “minor” art, by selective misquoting or misinterpretation of the authority, given also that “authority” is to be vilified and subverted as a matter of course. Hence post-Modernism. Add to that Greenberg’s mistake in entering directly into the gallery scene and the promotion of favoured artists himself, this left him vulnerable to accusations of “impure” motives, from which he has never fully recovered. The disparity between his gifts on the page, and his presence as an informal speaker or interviewee did not help either. One has to return to the writing, of which the Klee essay is a supreme example. It is a long time since I read his book on Miro, but it too merits another look. I’d also recommend that Janusz reads Seminar 6 1976 in the collected late writings, from which Carl has quoted, in its entirety. There is not likely to be a better rebuttal of the Duchampian tendency anywhere, or any time soon. Alan, Carl, please understand me properly. I do not want to discredit Greenberg. This is probably impossible, in the sense that he has his place and importance in the history of criticism. I do not need to fight his theory, others have long ago worked this topics out. I am only worried that by holding on to his authority, (his good recognitions and misconceptions as well) … he is used to discredit everything that happened “later”. And so divisions, resentments are sustained. Understanding and developing impossible. No matter how great He was, (he could deny pop-art, he he didnt` know the future), he should be aware, that in time of avant-garde, it will be impossible to stop the new comming movements. To insist today and to denial the rest of the artworld and to explain the current situation only by “market mechanisms” is reactively very similar to the mechanism of making all conspiracy theories (I know, the power of market, I am not naive). Have changes in philosophy (which is strongly connented to the art) were forced by the “market” too? If we look in the history, such denial of new art has always been present. You remember what were the reactions to the appearance of the impressionists. Greenberg was also the child of his time, and his writings , his approach fits clearly to phenomenological tendencies of that time. But the the human thought did not stopped since then. I know that I can learn from the Greenberg and profit as much as I can profit by reading Kant or Plato, but I will not immediately throw out in the trash Lyotard or Derrida. I don’t want to insult You either. I think Carl’s essay is very interesting, I would not write it better. I just thought there was no opposition on this forum. Such “non aggressive”, argumentative voice is always needed, in my opinion, if the discussion is to bring even a little bit more objectivity. For many years I have seen the current art, perhaps even more radically, most of it I considered scrap. When I tried to make an effort to know better of “what came later” I understood that it has its values, just others, without which I can not imagine the culture. I wanted to share my opinions, with You and with Tim Scott, who was one of my most important teachers and who now is probably sad hearing my current philosophy … but what can I say? Maybe the key word to be associated with Greenberg today is “authority.” It accounts for so much. But it’s important to remember that Greenberg has been an authority for years now. I think he was an authority for Alan. I know he was for my friend Bruce Gagnier. We might say Alan accepted Greenberg’s authority and Bruce rejected it—but that’s way too easy/simple. Both Alan and Bruce took Greenberg very seriously, and accepted some of what he had to say and rejected other things. For Janusz Duchamp is an “authority.” Apologies, Janusz, for oversimplifying things. I should mention this “authority” business is kind of a hot topic in “New York”/the States/the nonsite website. Charles Palermo has a new book out: Modernism and Authority: Picasso and his Milieu around 1900. And Palermo and Todd Cronan collaborated on this brief, “related” essay: http://www.worldpicturejournal.com/WP_12/Cronan_Palermo_12.html. In relation to Alan’s comment, it’s interesting that Greenberg did not believe Michelangelo was a great sculptor. I’ll find the quote in Homemade Esthetics when I have time. One other note: Although Greenberg thought that the best contemporary art was abstract, he also said that he “hoped” (if he had any choice, which he admittedly did not) that the best future sculpture would not be abstract because he believed that greater potential for sculpture lay in figuration. Just for the record, and as further related in Proper to Sculpture, I describe Michelangelo’s contraposto as “a pictorialism striving vainly for three dimensional realisation”, if I remember correctly. But I do regard him as a great painter, one of the greatest. Who wouldn’t? The Decorative figures, prophets and all the scenes on the Sistine ceiling, especially “the Creation of the Sun, Moon and Planets” are some of the greatest works of pictorial art anywhere. Less so The Last Judgement — too many arses. Unfortunately the over zealous cleaning of the Sistine Chapel seems to have had a disastrous effect, though I haven’t been to find out. I don’t want to be deprived of my first impression. It is also curious that Matisse in later life would deny being influenced by Michelangelo. And yet his early sculpture Aurora is obviously indebted to Dawn in the Medici chapel. The clue is in the title apart from anything else. And Michelangelo’s influence, stemming from that same sculpture is everywhere in the later odalisque paintings, sublimated of course. C’est la vie! Jock Ireland, I read through the review of Palermo’s new book concerning “authority”. (I cannot figure out what anyone considers Slavoj Zizek an authority on anything – the quotes from him are just stupid and pretentious.) I am mystified by the idea to judge a work of art is to “demand” that others agree with it (although Kant pretty much says this), or that the authority of a critic (or philosopher for that matter) requires that one experience “conversion” to that point of view. Greenberg’s writing is authoritative for me not because I feel compelled to follows his “rules” (there are none) but because when I look at the paintings of, say, Klee, I am able to see them in a more relevant and satisfying way than I would without knowing how Greenberg saw them. In other words, Greenberg’s taste is presented in his words in a way that is exemplary – appealing more than demanding or requiring. Someone doesn’t agree with my own taste; this simply means that I won’t discuss art with that person. If that’s the case, I’m on alert that there are probably other regions of experience (important ones) that we can’t discuss – where discussion would be pointless because no relevant agreement or disagreement is forthcoming. You don’t have to talk to everyone about everything. The Oracle told Socrates that no man is wiser than Socrates; Socrates interpreted this to mean that no person is in any better position to know than any other person and that he was himself “wiser” only in wanting to find answers whereas others are content in their ignorance. In other words, when it comes to the questions of philosophy, the teacher teaches the student that nobody knows the way to answers any better than the student him- or herself knows, and if that’s not the case, the wrong questions are being asked. (This is why the use of jargon always casts suspicion on the user’s authority.) Some are better at this sort of teaching than others but that the only kind of authority that matters when it comes to art or philosophy. “When it comes to the questions of philosophy, the teacher teaches the student that nobody knows the way to answers any better than the student him- or herself knows, and if that’s not the case, the wrong questions are being asked.” That’s a great/beautiful statement/thought—but I kind of think it only works in, maybe, Plato’s Republic. I’ve been a student most of my life. I’m 64 years old. I’m not that stupid. I’m STILL asking all the wrong questions. I’ve done some teaching recently. I think it’s not completely wrong to say that many other teachers regard me as a kind of danger to society: I “brainwash” students, I’m trying to set up some kind of cult for The Figure, I’m “conservative”—I hear this kind of thing a lot, mostly from other teachers, not from students, at least not students in my classes. And my sense of what other teachers do—the teachers who deplore my “teaching”—is simply that they don’t teach at all: the idea that nobody knows better than the student the way to answers is very common, very expedient in today’s academies. I’m not trying to discredit Greenberg as an authority. I just thought that Alan’s talking about Greenberg as an authority was very sharp. It made me think: interesting that Greenberg was (and still is for many people) an important authority: Greenberg was kind of replaced by Duchamp: the popular “authorities” on art in my life have been writers/intellectuals, not artists. Maybe Caro was an authority for some Abcritters. Maybe de Kooning was for me. Certainly Bruce Gagnier is. But somehow the written word has way more authority in today’s world. Fried says that certain works of art “compel conviction”; this is what Greenberg calls “quality” in art. How does something “compel” without coercing? I suspect that Fried arrived at this formulation out of conversations with Stanley Cavell, who at that time was occupied with the question of how the ordinary language philosopher claims the authority to articulate “what we say”, what we mean by our words. The ordinary language philosopher says something like this: “When we say (in ordinary circumstances) that an action is voluntary, we imply that there is something ‘untoward’ about the action.” The truth of this statement depends not on evidence but on my own examination of what I say, my testing of it with regard to myself. If I find that this is not how I use the word “voluntary”, then nothing will persuade me that the ordinary language philosopher is correct and I’m not, because his authority with regard to speaking English is exactly the same as mine and that of every other English speaker. So “compelling conviction” does not mean “persuading” – as a theory persuades, or not. It means inspiring or attracting or calling or inviting others to discover something that we do in fact believe and know but have somehow distorted or repressed or forgotten. It means inviting us (the audience) to discover our real convictions and how they matter in our lives. An “authority” (whether it be a work of art or a teacher) refers to something that leads us to the discovery of grounds that are so clear and so common that apart from our sharing of those grounds, there would be nothing about which to agree or disagree. The last clause touches on the issue of “identity politics”, which is ignored in the remainder of the article. The politics of identity implies that there are no common conditions for conviction – that what is compelling for a woman cannot be compelling for a man, and what is natural for a white person must be seen as arbitrary or “merely conventional” for someone who is not Caucasian, and so on – and all of this is known because a theory (of gender, or race, etc.) tells us, and a theory has authority because we are (once again) afraid to look and see and find out what our own experience has to tell us. I might ask, why does a student go to school? An “ordinary” answer might be: to learn stuff. A “fancy” answer might be: to recover what he/she already knows. I don’t mean to be dismissive by calling the fancy answer “fancy.” I think it’s great the way you’re able to bring Greenberg/Fried/Cavell/Wittgenstein to Abcrit, to drawing/painting/sculpture. I am, to some extent, impatient with the “fancy” take on things insofar as it suggests there’s some “fancy” way of getting around the messy process of “learning” stuff. I have a sense that you’re a little suspicious of Palermo. You might see him as part of a Duchamp/Warhol/Koons/Jancsy “axis.” I see him as very much a Kandutsch/Abcrit/Brancaster kind of guy. He begins his book with a quote from Greenberg on modernism: “All the verities involved by religion, authority, tradition, style, are thrown into question. . . .” Palermo then brings in Cavell: “The new difficulty which comes to light in the modernist situation is that of maintaining one’s belief in one’s enterprise. . . .” Palermo brings in Socrates and the Oracle. “Cavell sees modernism’s problem in philosophy’s origin, and his response to the challenge of philosophizing in the modern moment is to take up, to reappropriate, philosophy’s original challenge: having no access to external or higher authority, we are all given the task of finding the authority to speak for ourselves and to one another.” Isn’t this pretty much consistent with your thinking? The essay (it’s NOT a review) Palermo wrote with Todd Cronan is titled “Orthodoxy: Aversions and Conversions.” Palermo and Cronan connect orthodoxy and authority, but they don’t get involved with theory. Yes, Jock is a bit unfair. You believe me or not, but for me it did not matter much to judge anyone here. People have the right to be orthodox, liberals, or somebody else (because they will carry the burden of their beliefs anyway). “I just thought there was no opposition on this forum. The problem is that everything I say seems to be reduced to black and white conflict, while I see the continuity of the evolution of art, despite the fact that it consists of revolutionary moments of rejection and denial. And as I wrote at the beginning, I like the works of the Bancasterian group. From the very beginning, it was important for me to talk about sculpture especially with Robin, because his statements seemed to me to be the most provocative and challenging world of art. You can read again how many formal questions I have asked about art, and who and to what extent was interested in the discussion. Anyway, I thank you for the conversation, and your time and that you thought it was worth answering. Maybe it was a mistake that I dared to enter this forum. Know that it was very difficult for me and uncomfortable to enter into discussion with such a respectable group of artists or critics writing here with my PARTLY oppositional voice. Maybe that’s why there are so few outside voices here. But, maybe also Robin is right: maybe it’s not everyone`s cup of Tea. I’m just wondering why, I can appreciate or even admire Robin Greenwood’s new and old works (which does not mean I have no objections) or why I can admire both old and new works by Tim Scott and I would never try to confront these sculptures, Because I admire them for the completely different values that appear through these works. Why do I like some of Duchamp’s works, R. Morris, L. Bourgeois, or Tony Cragg, A. Kapoor, but also “Greenbergians” art. Maybe I have too elastic heart. but I do not want to join the unnecessary, in my opinion, the orthodox conflict of the type: Duchamp Vs. Greenberg, or yet another. Perhaps some of my statements were not well-fitted, because as I see it now, your group is linked by personal relationships that I do not know much about. But that is another matter. I find here a lot more controversial statements. And as I mentioned, I am interested, as are all the others here, in discursive arguments on abstract sculpture and painting. I’ve already said way too much here, Janusz, but let me just note a couple of things. Greenberg, a guy who certainly had a “personality,” talks wisely—and in ways I think you would agree with, Janusz—about “personalities” and “arguments” in Homemade Esthetics. I don’t like “abstract art”—but I don’t like it for all the reasons Robin doesn’t like it—and I do like Robin’s “abstract art”—and the “abstract art” of, of, of. . . Participating at Abcrit and Brancaster has helped me “sort out” all kinds of things, helped me mess up things too. Am I “welcome” at Abcrit? Who knows? But the bigger question is: Where is drawing/painting/sculpture welcome in today’s world? Again, participating here helps me come to grips with this big question. And a final plug for Charles Palermo’s book. Palermo’s your age/your “generation” (roughly I think), Janusz. He’s trying to get past that Duchamp vs. Greenberg conflict just as you are. Maybe everybody here is. It’s a “messy”/difficult process. Your brave, intelligent words make a big contribution. . .
“I might ask, why does a student go to school? An ldy knows. When you’re looking at art (or reading a novel or listening to music), you’re not in school and you’re not learning stuff. You’re either thinking, or you’re not. Sorry Robin, Much as I like Janusz (he was a breath of fresh air when he turned up in my class in Germany); I cannot be held responsible for his opinions !! Re….”Projecting ourselves into the position of of an early 20th C. viewer, (i.e. a viewer not already accustomed to the radical changes in painting and sculpture that Picasso’s work enabled…”) the ‘shock’ you mention as a response required that “the piece be seen and accepted as sculpture”. But surely the more likely reaction would have been the classic ‘my three year old could have done that’, and the concept of ‘sculpture’ would not have even entered the viewer’s mind ?Whereas the concept of the ability to view anything (object) as having aesthetic quality, as advocated by Duchamp, made it easy for the viewer to adapt his/her viewpoint from conventional norms. I would say that it was artists (primarily) themselves who understood Picasso’s construction as ‘sculpture’. and forced its acceptance as such on the viewer’s world. Whereas Duchamp’s more facile readymade concept was ‘readymade’ for everyman to embrace. Carl; I should perhaps have said ‘sculptors’ not ‘artists’ as the comprehenders of Picasso’s revolution in ‘construction’. The Russian Constructivists stand out as an early example. Unfortunately I have not to hand any documentary references as to who got there first, but I suspect it was not the general public of the time. As far as Duchamp is concerned, I imagine it was the power of his own propaganda machine that made his work acceptable as ‘sculpture’. It was Tatlin’s visit to Picasso’s studio in 1913? that did it, and through him to Gabo. Thanks Alan; no reference books to hand. All this is not much to do with Carl’s original essay om Greenberg, on whom I could perhaps add one small comment, which is that (to my knowledge) he avoided commenting at all on where he thought painting and sculpture should go AFTER Post Painterly Abstraction, Caro et al.. Leaving a playing field open for those, many, who wished to attack him on the grounds of ‘finalising’ art.. Of course, how could he predict a future ? he was wise not to: but then he was a wise man. Braque and Picasso …worked together on the development of Cubism. ….During the summer of 1912 they were in Sorgues when Braque made his first papiers colles. Braque explained: “First of all I was making paper sculpture and then I stuck them on a canvas, so those were the first papiers colles”. If this is accurate, it seems that the idea of a construction being conceived and seen as ‘sculpture’ was already extant, at least in the mind of the artist. It, of course required Picasso to turn the ‘papier colle’ back into ‘sculpture’. I think that Greenberg understood that with the eclipse of quality as the supreme artistic value, it would be foolish and dogmatic to try to influence what future art ought to look like. (Michael Fried failed to take this into account when he published Art and Objecthood, and I think that the programmatic tone of that essay (which is its strength) helped to forge the backlash that eventually buried that kind of art Fried endorsed.) Anyway, I don’t recall any published writing by Greenberg in which he tried to lay out the future. The question of why and how the idea of quality (or really the idea of criteria of value) came to be eclipsed is a difficult one and goes way beyond the so-called “art world.” The essay by Palermo is suggestive in this regard. He cites various authors on the concepts of orthodoxy and authority, but he focuses more on the debate itself than on the fact that orthodoxy and authority are now associated with a person’s racial, ethnic, religious or gender identity, as if what one has to say is less important than who is saying it, or as if the fact that the speaker has certain completely arbitrary characteristics implies the presence of authority or the lack of it. I have actually seen “Mandoline et Clarinette” quite recently. I wasn’t that interested. The important point to make about it is that it is not a sculpture. It’s a pictorial and frontal assemblage. That does of course link it directly to Caro, and thus accidentally and indirectly to the kind of constructed abstract sculpture that I’m interested in, but those are tenuous historical connections. There are lots of pathways that lead to constructed sculpture, and some are more relevant than this one. I’m completely uninspired by it and would rather look at Picasso’s paintings, on the whole. But let me emphasise the point: “Mandoline et Clarinette” has no bearing on anything three-dimensional, physical or spatial that can relate to sculpture now. It may possibly be linked to what John Bunker is doing because of the way real material is used in a legitimate pictorial manner – maybe. Yes of course Robin; as I quoted above, Braque stuck a ‘sculpture’ onto the canvas and it became a ‘collage’, i.e. painting. I think you are missing the point concerning Picasso’s constructions; it is not so much that they are ‘sculpture’ as you now want it to be understood; It is the excitement and joie de vivre of the IDEA of MAKINg in this way that Picasso conveyed, and passed onto sculptors whose previous assumptions were stood on their heads. Nobody had thought of making ‘sculpture’ like this before, and you would certainly not have been making your sculpture the way ir is had it not been for Picaso’s wild inventions.and nor would I. Sorry, but I completely disagree. Of course, as I have admitted, I may well not be making stuff in the way I make stuff now, were it not for Picasso, but where do you draw the line exactly in terms of technical influences? And you could also just as convincingly argue that Picasso’s “wild inventions” set a false trail for for sculpture (as did Caro, in some respects) and are not really any more sculptural or abstract than the Duchamp, which is also a construction, and (literally) three-dimensional, to boot. On reflection, I’d say the Picasso is not even a direct influence on John Bunker’s collages, since it is essentially figurative, whereas (in my opinion) John B’s work strives for a profound abstractness in its pictorial relations. I’m unconvinced that Picasso or Caro (or even Greenberg) can still have influence, other than an academic one that will act now as a restraint to progress. Thinking about abstract art has changed profoundly. Alan partially admits this, even as he longs for some arcadian simplistic past wherein we can all frolic expansively about. By the way, Tim, it is surely impossible to stick a sculpture onto a canvas and end up with a collage. That’s not what Picasso did. This desire to link in to some art historical event is very fishy! Let’s let the future decide. “Lots of pathways that lead to constructed sculpture” ?? Such as? (Without quoting Tucker on Rodin). Or on the other hand, how about the way some African sculpture is carved AND constructed in a way that demonstrates a greater understanding of three-dimensions than Picasso. And by the way, as I have pointed out many times, Caro did not think of his 60s sculptures as descending from the cubist collage until after his canonisation at MOMA . NY. IN 1975, when William Rubin drew that conclusion. They are not collages in any sense, nor even “constructed”, but assembled, fabricated, bolted together, sleeved together in the case of Early One Morning. The spatial thinking goes way beyond Picasso. I don’t understand the distinction between “construction” and “assembled, fabricated, bolted together, sleeved together”. And “Early One Morning” is indeed related to the cubist, pictorial Picasso. It has an “architectural” extention of the pictorial plane, but the spatial thinking does not become sculpturally active. Caro never got that far, and in fact, as you say, he reverted to an even more obvious Cubist approach in the seventies. End of story. “Inevitably going to lnfluence lots of sculptors”? What took them so long? Not until after Picasso, Tatlin’s corner constructions, The Bauhaus and Rietveldt showed them the way. And construction implies a quasi structural connection between parts influencing one another physically. Assemblage doesn’t. Caro is anti-structure in that sense. That is his originality, and it still provokes some “resistance”. Don’t get it yet – to assemble, fabricate, bolt together something is not construction? Presumably the staircases I made for a living for 15 years were anti-structural? Anyway, I thought you were anti-anti-structure. Ah, reliefs, yes. Not sculpture. Still a pictorial aesthetic. And Rietveldt made furniture and architecture. As anyone who has ever taken part in a crit with Caro will know, he was anti-structure. I don’t recall him ever using the words “Construction” or “structure”. That’s Tucker. And you’re arguing against yourself. You don’t want “structure”, physical structure either. You want total freedom in all directions. You are ignoring the bleedin’ obvious to score points. Just trying to get my head round your definitions. I am not the one who is making an argument for literal structure. Robin: in the quote I used I deliberately put the word ‘sculpture’ in inverted commas as I assumed the author did not mean an actual piece of sculpture but some three dimensional ‘messing about’ that Braque,not Picasso, was trying out. I cannot vouch for the truth or accuracy of the quote. The point of using it was that it is not ‘technical’ influence, as you put it, that is of any importance (from Picasso) but his imaginative take on what could be sculpture and the sheer originality of his thinking.. Duchamp’s, on the other hand selected an entirely literal and obvious way to be original , the only really imaginative aspect of which was philosophical, not visual, or even ‘technical’..
Of course there are other important sources for the origins of abstract sculpture; ;perhaps one or some of these can be seen as more truly relevant to the concerns of today than Picasso, Cubism, Caro et al..But awareness of that will only appear in the MAKING not in the speculating. Well, again, not sure I agree that you have to totally imbibe an idea in order to reject it. Why would that not apply to Duchamp too? I’d like to know exactly what you think is the “sheer originality of his [Picasso’s] thinking”, especially since I am refusing to accept that “Mandoline et Clarinette” is a sculpture. If the originality is not technical, what is it? It is surely quite a conventional pictorial composition – a bit boring, I’d say. And if it doesn’t work as sculpture, what claim has it to be original, other than as a displacement of painting? So far, we have a trail (from Alan) of some Picasso relief assemblages (that may or may not be constructions, hard to say), a couple of Tatlin reliefs, some Rietveldt chairs, and a decade of Caro that I would agree was very original, but didn’t provide a follow-on of anything sculpturally progressive. No doubt Alan can add Gonzalez and Smith to that. But it’s not a great line-up. I’d far rather be getting my inspiration and examples of ambitious thinking in art from other places. I might as well, because there is precious little in the content of this line-up that is useful to sculpture now. So, to repeat, a direct question: What is it in “Mandoline et Clarinette” that is original to sculpture? Let’s have it now, if it’s any good! And to address Carl’s undoubtedly eloquent essay directly: What are the norms and conventions of sculpture that this non-sculptural assemblage altered so profoundly? I personally don’t know of any norms and conventions that are worth either having or altering, but if it did anything to anything, it was surely to the conventions of painting, not sculpture. In other words, it added scope to the new discipline of collage/assemblage. Make of that what you will. FWIW I go back to that paragraph of Alan’s from “Proper to Sculpture” to begin to answer your questions, Robin. But I doubt these “answers” are going to make you happy, Robin. Alan called you a scourge earlier. I think Charles Palermo (or Apollinaire) might call you a heretic. You’re not happy with “authorities” that have satisfied earlier generations: Greenberg, Caro. You’re not happy with “authorities” that satisfy young people today: Duchamp, etc. At the same time you’re looking for some kind of “authority”—for something to help you with that “sense of the loss of a viably functioning tradition.” And “the price of sculptural quality” seems to be too much for you. ‘Construction’ and ‘Assemblage’ are not the same thing as any engineer will tell you. Alan is rght to point to the structural content of ‘construction’ as being crucial. ‘Mandolin and Clarinet’ is, of course, ‘pictorial’ in its construction, it is a painter’s vision. But it is nonetheless a construction; Duchamp’s is an assemblage. The “sheer originality of his (Picasso’s) thinking” ,to my mind is that ,it is totally unprecedented. Picasso (as far as sculpture is concerned) invented a wheel; it simply had not been seen before. Despite it “not working as sculpture”. it (construction) set sculptor’s minds working in ways that had simply not existed previously; your own thinking would not exist had it not done so. It may well be the case that there are other sour ces of “ambitious thinking in art” that you deem of greater value now; but you would not have HAD that thought if it were not for the lineage we have been talking about. As for imbibing ideas, I see no reason for not applying that to Duchamp also, because in his case it is literally a matter of imbibing an idea, and not of making anything of consequence. “it (construction) set sculptor’s minds working in ways that had simply not existed previously; your own thinking would not exist had it not done so.” In fact the frontal, pictorial thinking in sculpture that this particular work exemplifies screwed my thinking about sculpture for quite a long time, thank you very much. To say the Picasso is “unprecedented“ is meaningless. So is the Duchamp. You have to cite some specific contribution to sculpture to prove originality. “Mandoline et Clarinette” is very nearly as “throw-away” as the Duchamp. If you are REALLY going to do something original in sculpture it takes a bit more application than Picasso could ever manage. Phony revolution! This, as usual, is all about painting. It’s about extending pictorialism into three dimensions. It’s not even particularly new, and it’s certainly always troublesome, even for painting (see the Richard Smith show at Flowers for a more recent manifestation of those particular pictorial issues). I like and admire Greenberg, but he too was all about painting. It would seem he liked sculpture to be as close to painting as possible. And whilst I would agree that Carl’s quote on Klee is an exceptionally insightful and beautiful bit of writing (would that there was someone now writing with such penetrative sensitivity – Sam Cornish, where are you? Mired in the sixties, that’s where), it has no bearing on sculpture. If you want to talk about extending some of the conditions of sculpture, rather than overthrowing fictional “conventions”, that’s a different matter. But you are not going to overthrow the conditions of three-dimensionality or plastic spatiality – in favour of what exactly? – without moving into an area of sculptural failure. Jock’s comment is for once very close to the point. Picasso’s originality in sculpture, if such it is, is to its detriment. To his supporters I would say: How come a hundred years later we are still having to fight for what is REALLY proper to sculpture? By the way, Tim, you and Alan need to confer on the construction/assemblage thing, because according to him, all Caros are assemblages. But really, who cares. The important distinction here is that the Picasso is NOT A SCULPTURE! A word to Jock: there is no functioning tradition in abstract sculpture, it’s NEW! Right now! This idea ” ….that you would not be where you are today….” is obvious. We must try to say more precisely what is so important and suddenly that is not obvious and is less rooted in fact and in any chronology. What we do know is that so called abstract sculpture had been many things in its attempts to be abstract and non pictorial. What emerged in the 70’s was a move towards a greater three dimensionality.What was taken from history was the material, steel, and its processes of construction and fabrication. This most exciting area of abstract sculpture in as much as it irks some to admit it , it is relatively uncharted territory! There are choices to be made and there are no guarantees in attempting to make new art. I think this is a perfectly normal ambition. We must wait for some conclusion as to wether any of this work is any good as art at all. To debate the art that is being made today and comment and analyse it is normal ! The way Braque, who apparently started the whole thing, put it –was that construction means to conjoint homogeneous elements– assemblage means to conjoint heterogeneous elements. Give or take the odd caveat, that is a good way of putting it. As an aside, off the point a bit, I would like to take this opportunity to correct a horrendous typo that remains in my Steel Sculpture Part 1 (From Gabo to Caro). Perhaps I am not explaining myself well enough. 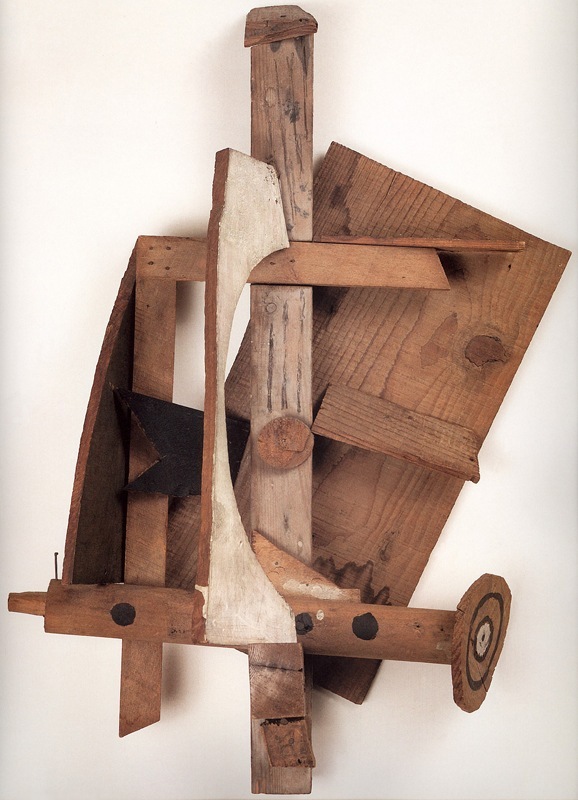 I am not saying that Picasso made a (constructed) abstract sculpture, good or bad. I am saying that his painter’s construction as an idea, as a way of thinking, was original in KIND because of the example it set for a new sort of sculpture to emerge. I would suggest that in your own case the “screwed up thinking” you complain it caused was simply part of a learning process that you probably would have been worse off without. How would you have arrived at your present state of ‘revelation’ without knowing what was to be rejected and replaced (from experience) ? The Duchamp is niot ‘unprecedented in the Picasso mould because it is merely an illustration; the illustration of an idea; good or bad ides according to one’s view, but nonetheless only an illustration. Illustrations were two a penny at the time.and certainly not unprecedented. “Extending pictorialism” in 1913 was a very different kettle of fish than in the mid to late twentieth century; I am not a painter, so I defer to any knowledge of this that is forthcoming. Vestigal teeth, fingers and eyes still sound horrendous. I renounce such ancestry. Nice try at changing the subject, though. As for the Braque definition, it’s splitting hairs compared to the chasm between Picasso wall-based construction/assemblage/relief/pictorial-thingies and anything approaching the territory of real sculpture. I’ll have the caveat please, with a pinch of salt. Robin’s insistence that Mandoline is “not a sculpture” is ahistorical and reminds me of the overly intellectualized approach to art that is displayed in Duchamp’s Bicycle Wheel and other works in the Dada sensibility. You can say it and you can say it again, but saying it doesn’t make it so, just as Duchamp’s implicit declaration that there is no special category of things corresponding to “art” didn’t stop people from making things that – by virtue of the kind of interest they elicit – are experienced as artworks. All you can do with such an assertion is repeat it. Robin’s assertion also suggests the attitude of those people who in 1913 denied that Mandoline is a sculpture. Presumably, some people rejected Picasso’s cubist reliefs because they abandoned certain conventions and norms that were accepted as definitive of the art of sculpture – conventions and norms that had to do with sculpting in the sense of forming, carving, molding, shaping and casting – working a mass of raw material by removing portions of it (as with marble) or forming the material (as with clay) or casting (as with bronze). That is, I believe, an intellectual or theoretical rather than an intuitive or felt judgment, in Greenberg’s terms, not a judgment of taste. Picasso’s and Braque’s cubist paintings made the depicted space of painting more and more shallow to the point where the need to acknowledge the painting’s surface and shape led to collage and then out into the literal space of the viewer – that is, the space of sculpture. I suspect (without knowing) that Picasso did not set out to “make a sculpture”; rather, I would guess that he simply followed intuitions that had been revealed in the course of making cubist paintings and somehow ended up with a sculpture. To observe that Mandoline relies on “pictorial values” is does not amount to a criticism of the work because it is completely obvious and also a-historical. In 1956, Clement Greenberg wrote “Roundness Isn’t All: Review of The Art of Sculpture by Herbert Read.” The review criticizes Read’s dogmatic assertion that the essence of sculpture MUST consist in three-dimensionality, which implicitly asserts the supreme value of tactile associations. “It is true enough that the arts have over the last century shown a consistent tendency to withdraw into their respective mediums and ‘purify’ themselves, by renouncing illusion, among other things. Just as painting ever more insistently declares its flatness, sculpture has declared its roundness and the nature of the materials of which it is made…. But sculpture, having attained a maximum of roundness and compactness with Brancusi and Arp, some forty years ago underwent a mutation without parallel in any other contemporary art and issued from Picasso’s hands in a new mode that had its origin in Cubist collage and bas-relief. I wonder which way Alan will jump on this one… and Tim…? I’d say they are both wrong, Greenberg and Read. Attaining a “maximum of roundness and compactness”, as per Brancusi and Arp, has very little to do with my understanding, such as it is (but it’s probably better than Carl’s), of three-dimensionality. Can I suggest a rule of thumb? If the artwork (and remember, I’m not trying to define what is or isn’t art) requires to be viewed from a number of viewpoints, it’s probably in the realms of sculpture. If it requires only one viewpoint, even if it has 3-D bits and pieces, it’s probably a pictorial relief or assemblage (with caveats). If it’s 3-D but still has only one viewpoint, it’s probably a seventies Caro or other Greenberg follower. Technically, that’s a dog’s dinner. Doesn’t (real) architecture require to be viwed from all sides? Wise move to confine your disapprobation to Caro’s seventies sculpture. But I’m tired of this bickering. Unless we’re looking at specific works, it’s all pointless. There is no doubt that there are no antecedents to the kind of sculpture we now recognise as abstract constructed/assembled before Picasso’s wooden reliefs. And who was it who drew attention to the formal qualities of African carvings. — why it was Matisse, Derain and Picasso, painters all. Sculptors were very late in the day to catch on, being hidebound by dogmatic beliefs, as Greenberg rightly points out. As he said to me whenever I pointed out some “logical” polarity in art — “Yes, but I wouldn’t want to be categorical about it”. Hyper-pragmatic to the end. I balked at it of course, but now can see the point. We were looking at a specific work – and may I remind you that I looked at it in the flesh quite recently. And the point, which you and Carl continue to slide past, is the criticality of three-dimensionality to the development of abstract sculpture. I’ve provided rules of thumb that might enable us to talk (pragmatically) about the differences between work of a two and three-dimensional nature, but if that’s of no interest, let’s drop the discussion. At its most essential, Carl, one’s response to good and great art, intuitive or otherwise, is always ahistorical. The reason why I quoted Greenberg’s review of Herbert Read is that it looks to me as if Robin’s insistence on “three-dimensionality” today is very similar to Read’s insistence on three-dimensionality back in 1953 – and Read’s implication (that Picasso’s bas-reliefs were not sculpture but rather “wrought ironwork”) is very similar to Robin’s (Mandoline is “not sculpture”). And I agree with Greenberg’s observation (which is completely contrary to the popular perception of Greenberg in the minds of those who don’t bother to actually read his writing) that this insistence is based on “a definition of the medium rather than from actual experience of works of sculpture.” Ultimately, I think that this sort of insistence (described by Greenberg as “dogmatic”) is at the heart of Duchamp’s activities. Oh, the irony of being labelled theoretical and dogmatic by Carl! I admit I am, a little, and proud of it, but although I’m now the wrong side of sixty-five, my dogma and theories are updated regularly, unlike Carl’s, which are also the wrong side of sixty-five. But I am also pragmatic – in fact, hyper-pragmatic, to quote Alan – in sculpture-making, and that’s what drives my theorising. It is now impossible to make original and inventive and viable abstract sculpture out of the pictorial frontal mode that Picasso is supposed to have initiated. It cannot be done. I can only think of Peter Hide and his cohorts in Edmonton who are still pushing that line, and I don’t think it stacks up. Where is the fruit of this lineage? The whole thing is dead in the water. Although my introduction to abstract sculpture was via the sixties New Generation work, including and especially Tim (! ), which does indeed form a historical link to Picasso, albeit at several removes, my first personal initiation into the possibilities of a significant and profound three-dimensionality in sculpture came in the early eighties with the inception of “Sculpture from the Body”. Carl will know little of this, but Alan will know the whole story, as he was personally involved. And Tony Smart may argue, probably correctly, that the beginnings of this acute change of direction were at Stockwell Depot in the seventies. I can’t really comment on that, not being involved until right at the end of it, in 1979, when the problems that abstract sculpture faced, in part because of its confused heritage of a superficial aesthetic, had become all-consuming. On the contrary, it is a profound indictment of this line of work as the product of pictorial thinking by painters who discovered they had to “cop out” on painting once they had begun collaging. They thought they could solve the problems their painting faced by entering the realms of sculpture, like many have done since, and are still doing even now. This is VERY close to the Duchampian model of “getting out of jail free” by switching to literal three-dimensions. In fact, it is exactly the path Duchamp himself took. This engagement with literal three-dimensions bears no close relation to the kind of sculptural three-dimensionality that is now emerging. This requirement for abstract sculpture, as well as its involvement with an all-over plastic spatiality and physicality, seems to be something very few artists or commentators who are not directly involved can understand at the moment. So be it. Hopefully they will catch up with time and an open-minded approach, and perhaps some hard work. I’d recommend Carl and anyone else watches a few hours of recent Brancaster Chronicle discussions on sculpture. They are heavy-going, but VERY pragmatic and VERY intuitive! Things have moved on a great deal, even from the thinking around “Sculpture from the Body”. As for Alan’s assertion that the short history of abstract sculpture is pioneered by painters – well, that’s a big part of the problem. But it’s the painters’ turn now to play catch-up. I’m still on the right side of 65. At least for a few months I can speak with AUTHORITY. Also I’ve been properly educated at the New York Studio School—and by Sam Cornish who introduced me to Stockwell Depot and who on Twitter suggested that some of Peter Hide’s work might be described as “mournful”—and by Alan Gouk who in “Proper to Sculpture” suggests that people were making sculpture—even “abstract” sculpture—before the 20th century came along—and by all the unedited openness at Robin’s websites. I can’t really count Greenberg among my teachers. In my little corner of the world what Al Held referred to as the Greenberg Gulag was something to stay away from. I read bits and pieces of Greenberg though. What I read I found interesting. I couldn’t figure out what was “wrong” about him. Maybe that’s still a “question” at least for those of us over 60. It’s easier to talk about what’s wrong with Robin. He just won’t listen! I worry a little about the confidence with which Tony talks about “abstract sculpture” and “three dimensional abstract sculpture” and “non three dimensional abstract sculpture”—but when he talks about there being “no guarantees when making new art” I’m with him. The need to trust your “self,” your intuition, your feeling—to let go of what you “know”—and to let stuff you don’t understand shape/change/disrupt the forms you’re working with seems to me to be at the heart of things now. I think Alan has said it’s been at the heart of things since Michelangelo. It’s not easy, but otherwise you’re just borrowing forms. They might be great forms—forms from “Mandoline et Clarinette.” You might use them masterfully. But you end up with something that’s empty. And what do you know of three-dimensionality, Jock, old boy? Show us some of your work… Is it secret? My work isn’t secret. It’s just terrible. But for years now I’ve been “ripping off” the work of Natalie Charkow Hollander. Natalie makes reliefs based on paintings. You can Google her name and see some of her work online. Not likely to appear anywhere else anytime soon. Anyway: reliefs based on paintings: you hate it, right? It’s pictorial, etc. But I’ve been looking at her stuff (with my special brand of stupidity) for years now. At first I was attracted by the “spatiality”—the “deep space” she gets in her little reliefs. My work recently reached a kind of peak of formless “spatiality.” I can’t explain why my work is so bad. Making terrible sculpture does help me see other people’s sculpture I think. (Maybe I’m kidding myself.) Anyway after getting lost in my own upright/vertical mud pies, I started to see the three dimensionality in Natalie’s work. It’s easy to see Natalie’s forms as kind of easy, conventional, blocky forms (that’s the way I’d looked at them)—but, no, her forms come out of the “space,” the “deep space” they’re in—they’re “real” “three dimensionally” because of the space they’re in—and they’re REALLY three dimensional. Hope this makes some sense to you. Think it might. You at least talk about not being afraid of illusion, etc. And you take Poussin seriously. Natalie does too. Interesting question: does Natalie “borrow” her forms—or her content—from the paintings she works from? Is she just a “talented” artist who has nothing to say. I think the answer’s no. ‘Homemade Esthetics’ is one of these books that, no matter how many readers it has, will never have enough. Though it was written in the 1970s, it has never been more relevant. It’s also often funny, as when Clem demonstrates the impossibility of proving aesthetic judgements by being unable to show that ‘The Waste Land’ is better than a piece of Victorian doggerel by Sir William Watson. I wish he, and his biting sense of humour, were still here.